This week sees the release of THE COLDEST WAR (UK | ANZ) , the second novel in Ian Tregillis’s landmark series, the Milkweed Triptych. The trilogy began with BITTER SEEDS (UK | ANZ) and concludes with the forthcoming NECESSARY EVIL (UK | ANZ). For that reason we were really interested to hear these two exceptionally clever Orbit authors in conversation about their series. The results are below! Ian: In an afterword to THE ATROCITY ARCHIVES (“Inside the Fear Factory”) you mention that while writing the first Laundry novel you were advised to avoid Tim Powers’s novel DECLARE. And that later you were made aware of the Delta Green supplement to The Call of Cthulhu RPG, which again resides in a similar neighborhood. But of course even Powers wasn’t the first to marry espionage and the occult – Dennis Wheatley’s novel THEY USED DARK FORCES first appeared in 1964, and Katherine Kurtz‘s LAMMAS NIGHT was published in 1983, as just two examples. In the above-mentioned afterword, you make a strong case for why it’s natural to blend horror, the occult, and espionage. So is this an idea that’s continually bubbling into the aether to be rediscovered by other writers? Or have we reached the point where we’re having a conversation within an actual subgenre? Charlie: It is indeed an actual subgenre! Or maybe a sub-subgenre: a corner of that section of urban fantasy that is preoccupied with the interaction between agents of the state and the occult. Looking to our own work, we can simply step sideways from “agents of the state” into “agents of the *secret* state”, and then spin widdershins and drill down into the rich, fertile soil of Lovecraftian horror. Or, through a glass darkly, the warped vision of the Ubermensch/superman deployed in pursuit of evil ends. One of the things I enjoy most about the Laundry books is the way they juxtapose spy drama, Lovecraftian horror, and the banality of office politics. They combine the profound and the mundane to great effect. Does it work because the narrowness of the corporate mindset can be laughable, or because matrix management is merely a different kind of unspeakable horror? Charlie: I’m not certain. However, I will note that both horror and humour are tints that we can apply to a narrative; the same plot structure and characters could in principle be written into a horror story or a farce, purely depending on how we colour the narrative. Next, we use humour to offset the bleakness of horrible events. Some of the greatest war novels are on some level broad farce – CATCH 22, for example, would be ploddingly unexceptional if you stripped the surreal humour out of it. Finally, the mind-numbingly unimaginable cosmic scale of the cosmos is daunting: how better to handle it than to find something equally mind-numbing but petty and claustrophobic with which it stands in contrast? The working conditions of the bureaucratic office are unpleasant, and horrifying if you view them in the right light. I’m thinking here of a Leonard Cohen song, “First we take Manhattan”, the opening lyrics of which are: “They sentenced me to 30 years of boredom / for trying to change the system from within”. 30 years – that’s a life sentence for murder. It’s nearly a billion seconds. One can easily comprehend a second of boredom, or even a thousand seconds – about 20 minutes – but how the hell does one wrap one’s head around a billion? It’s most of a working life! And so, we have a tendency to undermine the boredom by applying situational humour to it. The longevity of the “Dilbert” cartoon strip speaks to this – the unpleasant goldfish-bowl microcosm of office politics emerges from common human personality traits that interact predictably, farcically, and dysfunctionally, in virtually every organisation. Final rambling thought (I’m babbling here, trying to come up with explicit associations for stuff I’ve been doing instinctively): we frequently hear people use Hannah Arendt‘s sound-bite about Adolf Eichmann, “the banality of evil”. What do you get when you juxtapose banality *with* evil? We can take the banal seriously, but in the face of continuous exposure to ultimate evil it’s hard to come up with any response other than a bon mot, because desensitization takes its toll. Hence the popularity of plush Cthulhu bedroom slippers. Ian: Fiction writers aren’t alone in thinking the occult makes an attractive dance partner for intelligence services. The CIA infamously spe nt millions of dollars on its remote-viewing program, Project Stargate. It has also been alleged the Soviet navy attempted to investigate telepathy as a means of secure communications with submarines. But the Laundry contends with extraordinarily dangerous powers, as do the intelligence operatives of the Milkweed books. How much stock would you put in the notion that a real-world three-letter agency *wouldn’t* jump at the chance to commune with ravenous extra-dimensional beings? Charlie: None whatsoever! Which is why at least one of the Laundry’s foreign counterparts, the Black Chamber, is pretty clearly run by the many-angled ones, and the Laundry itself is full of archives documenting highly questionable compromises. In fact, “the road to hell is paved with good intentions” could well serve as the overarching theme of the Laundry Files as a series (I have a long-term plot that is slowly unrolling) . . . Yes, if they got their hands on this stuff they’d use it. We have met the enemy, and we are doing our best to turn into them before they turn into us. Ian: I carry vivid memories of the Reagan-era arms race, and going to bed at night fairly certain I wouldn’t wake up in the morning. That might be why I have a macabre fascination with the Cold War! It’s interesting, too, that we’ve both recast that conflict as something even darker. In THE COLDEST WAR, I sought to replace nuclear brinkmanship with a stalemate between blood magic and mad science. Of the several qualities that make your work noteworthy, the thing that springs foremost to my mind is your versatility. The Laundry novels, for instance, are laugh-aloud funny in places. (I convinced a friend to read the series after reading a passage from THE JENNIFER MORGUE that had us both gasping for air.) Is that the result of a deliberate decision to sprinkle bits of levity into an otherwise harrowing tale, or does it just arise naturally as a consequence of Bob Howard’s character and his environment? Charlie: Well, the original idea when I began writing back in 1998/99 was: “slashdot-reading, sandal-wearing IT geek falls into Z-Men/Len Deighton territory, hilarity ensues”. Because the relatively up-tight conventional world of the civil service is simply not the appropriate stomping ground for a geek. (This was back before geeks became a marketing category, back before neckbeards were even quasi-cool.) So of course I also needed a reason why they *couldn’t* fire him. And I was messing around with the idea of Lovecraftiana and government agencies at the time, and it seemed a natural fit. The friction between Bob and his managers in THE ATROCITY ARCHIVE has some autobiographical context that I’m not going to go into here, but amplified by juxtaposing the cosmic horrors with the petty bureaucratic obstacles. And I sent it to my agent and she said, “this is really cool, but I can’t sell it. It’s got spies, and comedy, and horror, and SF – nobody will buy it! It’s too cross-genre.” (This was before our micro-genre was on the radar). In the fullness of time it sold to an obscure Scottish SF magazine, and sold again to an obscure American genre small press. Then the novella Golden Gryphon asked for to bring it up to book length won a Hugo award, which in short order got my agent’s attention, and the attention of my editors at Ace and Orbit. So I had to come up with a sequel and sequels breed in dark corners among the dust-bunnies under the cupboard, which meant I needed a story arc or at least some idea of where I was going. Which brings us to . 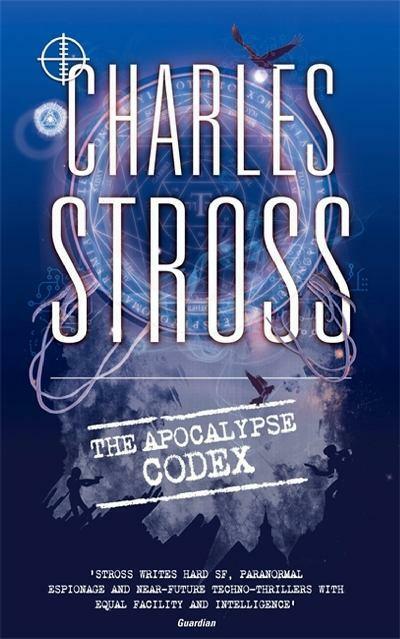 . .
Ian: Speaking of Bob Howard, his career follows an interesting arc over the course of the series – especially given events at the end of THE APOCALYPSE CODEX. How much of Bob’s fictional career is informed by things you’d observed in the workplace before becoming a full-time writer? I have never managed anything bigger than a cat’s litter tray, but I’ve observed the various pathologies of management from underneath. One of the commonest errors is promoting somebody who’s very good at a technical job into management, to oversee people who are less good at that same job. They tend not to be great managers (management requires people skills, after all), and get irritated with their less-competent subordinates while their own skills slowly decay from lack of use. The left-turn in Bob’s career in THE APOCALYPSE CODEX was necessary because I realized that if he continued in a straight line he was going to turn into an office bore who never actually did anything interesting any more. (And by “interesting” I mean “have adventures”. And by “adventures” I mean horrible and unpleasant experiences that happen to someone else a long way away that are fun to read about.) So I decided I needed a framework that would allow me to keep Bob out of senior management while giving him immense responsibility but little power (and a ton of oversight by meddlesome bosses). Ian: Finally, you’ve stated on your blog that the looming apocalypse codenamed CASE NIGHTMARE GREEN would transpire perhaps 2/3 through the planned progression of the Laundry series. As a fan of the books, I’m dying to know how the series will continue after CNG. But as a writer, I originally speculated that future scenario had been engineered to ensure the Laundry series came hard-coded with a definitive end. Was it always your plan to put CNG in the middle of the series? Charlie: That was the idea a book or two ago – a 9 book series with CNG fairly explicitly arriving in book 5. Except, it doesn’t. I realised partway through THE FULLER MEMORANDUM that the original deadline for CNG would have actually passed by the time the book came out, so I retconned a fix: CNG now covers a seventy year period, and by book 5, THE RHESUS CHART (forthcoming, Orbit, 2014 (I hope! )), we’ll be 3-4 years into it. Things are slowly getting weirder and weirder, after the manner of the proverb about turning up the heat under a pan with a frog sitting in it. Books 5 and 6 happen during the early stages of CNG; I’m now thinking in terms of book 7 being where it very visibly arrives with a bang. But doubtless I’ll change my mind before I write it . . . ! Ian Tregillis’s novels BITTER SEEDS (UK | ANZ) and THE COLDEST WAR (UK | ANZ) are available now. The third novel in the Milkweed Triptych series, NECESSARY EVIL (UK | ANZ), will be released on 30th April 2013. 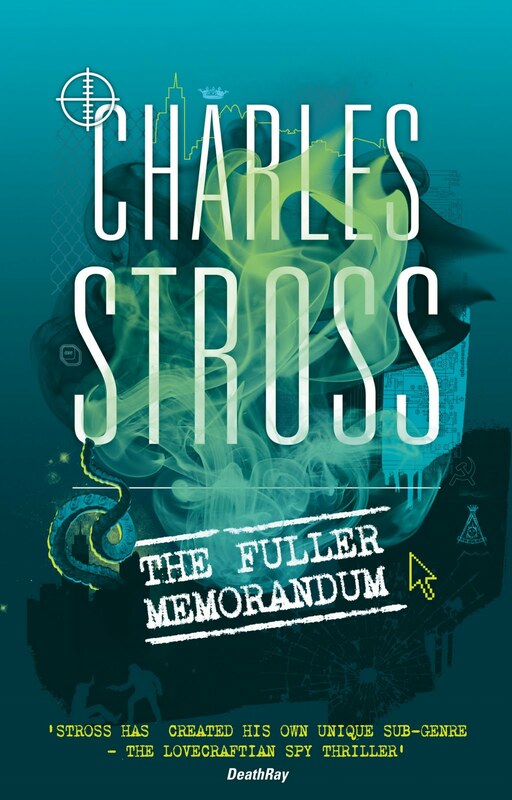 Charles Stross’s Laundy Files novels, THE ATROCITY ARCHIVES (UK | ANZ), THE JENNIFER MORGUE (UK | ANZ), THE FULLER MEMORANDUM (UK | ANZ) and THE APOCALYPSE CODEX (UK | ANZ) are all available now.